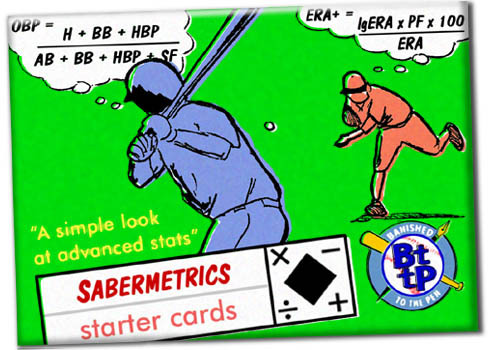 Presented here is a virtual baseball card series that aims to serve as an introduction to sabermetrics: Why is on base percentage better than batting average? What’s a good OPS? What does wRC+ mean? Our goal is to provide a basic understanding of the concepts behind the crazy acronyms as they become increasingly common in baseball coverage. Most entries consist of a brief description; a “range table” that breaks down what’s good, average, and bad; and top-five MLB leaderboards for the past two seasons. 9/5/17: “Pack 1” consists of an intro (1), OBP (2), SLG (3), OPS (4), and OPS+ (5). ZIP file (3.5 MB) with cards 1-5. 10/13/17: Three cards for “Pack 2” added – BABIP/Run Expectancy (6), wOBA (7), and wRC+ (8). 11/30/17: Two cards for “Pack 2” added – Defense (DRS/UZR/FRA) (9) and WAR (10). ZIP file (3.0 MB) with cards 6-10. Click on the side arrows to advance back and forth. Mobile users can pinch-and-zoom to enlarge. By Darius Austin, Ken Maeda, and Rob Mains. Thanks to Brandon Lee, Daniel R Epstein, Khurram Kalim, and Eric Roseberry.